I do remember the judge making a distinction between victim's impact statements in front of the jury and himself. So even w/o a phase 3, the victims will be able to speak. @Just thinking. I wasn't insulted. Plenty more insulting things have been said. Does anyone know if the victims get asked if they would like JH to receive the DP? No more objections from the DA or the defense. Ready to move forward! Me, your story backs up my feeling on cases like this: none of us should presume to speak for the victims. We cannot know what they 'should' want or 'should' do, and we cannot know what will 'help them find peace' or anything else. It is truly presumptuous for any of us to spout off about what these victims 'should' be feeling or 'need' to be doing (and I'm thinking of a particular poster). And these victims do not all speak with one voice. I can only respect each of their voices. In my opinion forgiveness can be given but that doesnt mean you accept what the action was. Justice will NEVER be obtained by anyone that lost someone because it will not bring their family member back. JH if he is sentenced to the DP will not bring anyone's family/friend back. @Diane Lacey Leuty - You know your tax dollars pay for the prosecution as well, right? James Eagan Holmes is solely responsible for mass murder, maiming and bloodcurdling terror to people; individually, a community and this nation. 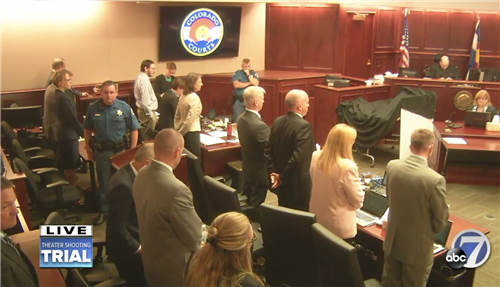 It is within the law of a Colorado jury to decide his fate. Even if that means he shall be put to death. Phil, how about a poll after closing arguments about whether or not we are moving on to phase 3? I agree with Just Thinki. Just because you forgive someone, doesn't mean they are not held accountable for their actions. Can always hear the door as he jury enters/exits. I'll try. If they go after 4:30, I have to hit rush hour traffic, my time. @LG you might want to read up on your state's executive orders. LG-I had to check out for a while ...which comment did I make that you were trying to also make a statement about? I'm interested to know where our opinions align-although from what you've been writing, I think it's on almost or every point. Thanks again- 'just wondered which comment elicited your 'clapping'. Ha!